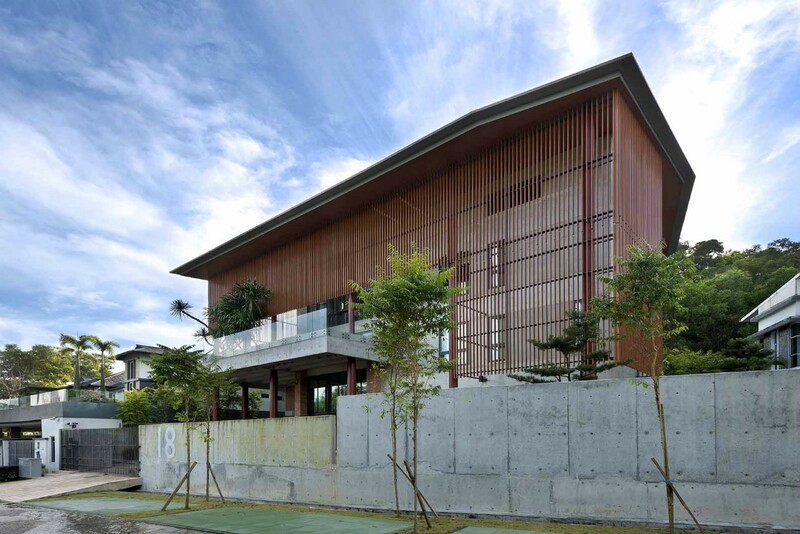 No.18 House is a three-storey green residence located in the suburb of Sunway Damansara, Petaling Jaya, Malaysia. The site slopes up gradually from the street towards the rear, meeting the foot of an abrupt reinforced incline that marks the start of the nature reserve behind. The brief called for a sustainable green home for a large family with generous open living spaces to entertain guests and private rooms customised to each family member鈥檚 requirements. The house plan was conceived as a series of large halls based on 6m X 6m modules that are linked together both horizontally and vertically to create interlocking spaces. 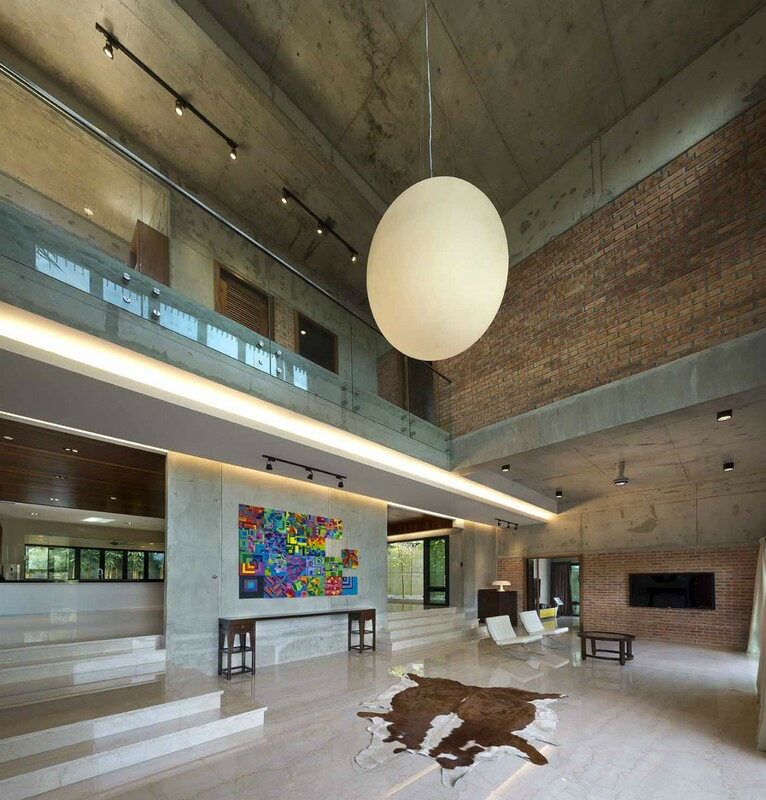 These are bound together by raw off-form concrete structure and earthy clay brick screen walls. The resulting three-storey box has spaces cut-into and cut-out of it to create high volume spaces, courtyards, nooks and hanging gardens. The front arrival portico is supported on a formal series of large diameter sienna red steel columns. Beams that bear the roof garden above run across the slab in their exposed concrete form creating a visual landing strip upon arrival as the row of lights hidden behind each beam is unveiled file by file. A collage of concrete, brickwork and timber becomes an intentional feature wall by the main entrance. A solitary concrete wall with a rectangular cut-out, flanks the right side of the driveway forming a private lawn that fronts the open living area beyond. 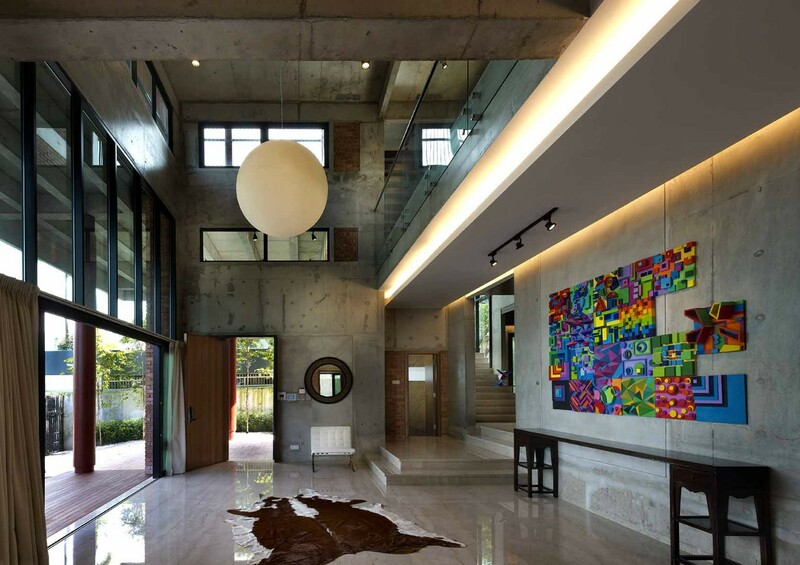 The entry foyer and formal living space is a tall voluminous space with a large dragon ball light hanging in mid air. This is an open space designed to promote natural ventilation and lighting, and opens out unto the private front lawn. Even the bamboo garden beyond the kitchen is visible from the living hall 鈥?an openness that is visually and spatially liberating. The adjacent hall is the dining room that has sliding glass doors on both ends. 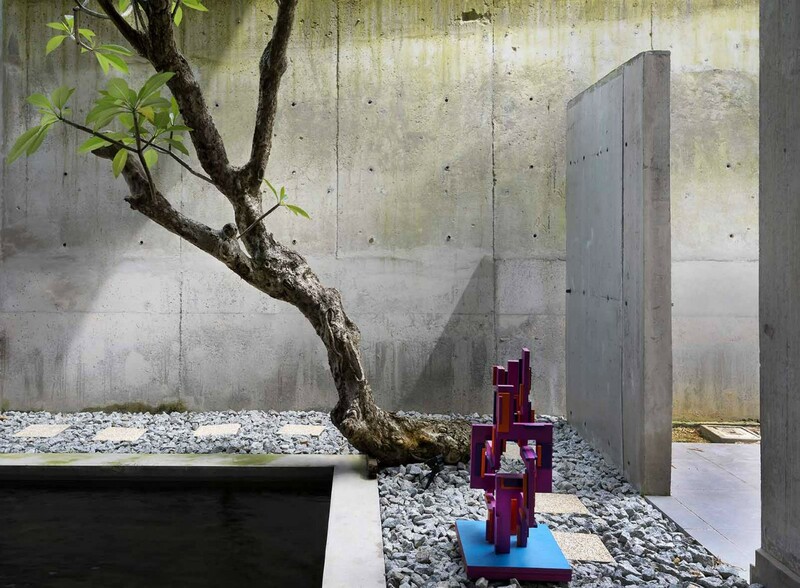 One end opens into the poetic garden with a sculptural frangipani tree as a backdrop and a koi pond with fountain in the forefront, and the other end opens to a forest of saplings in a bed of pebble stones. The kitchen and service yard is located to the rear of the house. The sculptural stair wraps around an off-form structural wall that takes one through to all the upper levels. The stairwell acts as a lantern contained by a double glazed enclosure and illuminated by the moon-like wall lights. The double volume informal family hall is located on the first floor overlooking into the fountain courtyard. A hanging roof garden with giant yucca trees sits on the roof of the front concrete portico. Hallways lead to the various bedrooms. The master bedroom sits on the second floor with a zen exercise and tea room. 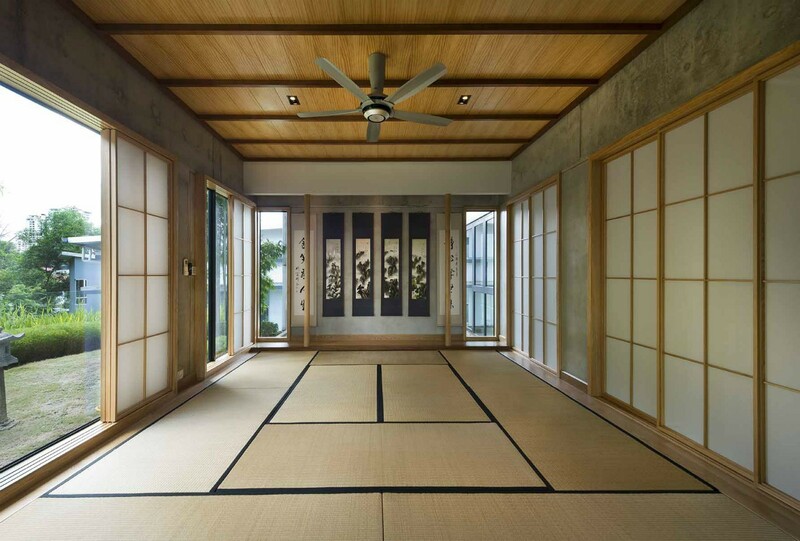 Shoji screens replace window blinds and tatami mats line the floor in the room that is connected to a Japanese garden terrace. The western fa莽ade is protected by a wraparound metal box louver sun screen. The house is totally cross ventilated with minimal mechanical air conditioning. The large roof has 200mm thick 50kg/m3 rockwool and two layers of heat reflective foil in addition to a fully ventilated roof space that houses the rainwater harvesting tanks. The roof also houses an array of photo voltaic panels that generate up to 5 KW peak of electricity, solar hot water panels and wind turbines to ventilate the house interiors. Other green features are the use of low VOC paints, raw material finishes, water saving taps and sanitary wares, low energy light fittings and local native landscaping. 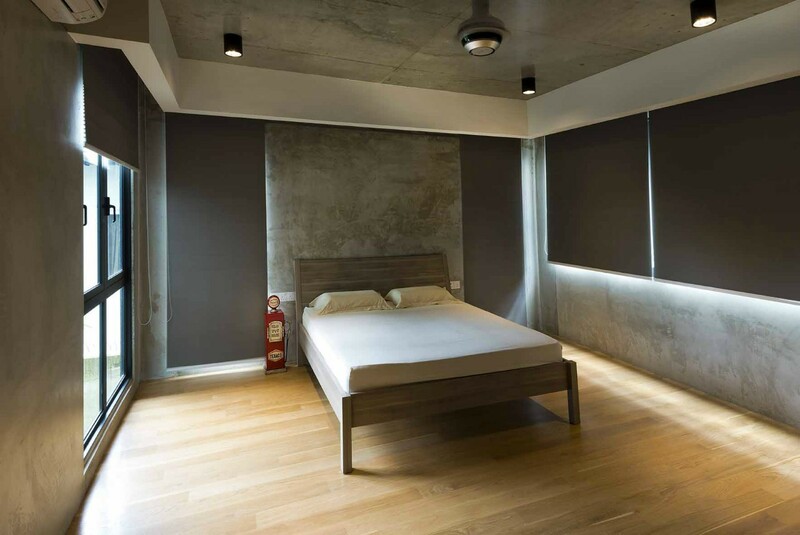 The overall aesthetic is one that is clean and minimally raw and natural.